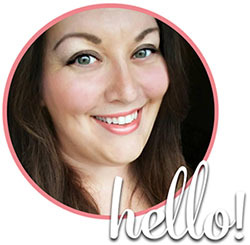 Note: This blog does not provide medical advice, diagnosis or treatment. Please consult with your healthcare practitioner, your needs may vary. You may remember me mentioning before that I have to watch my blood sugar. This is why you see low carb recipes in my posts from time to time because we try most of the time to adhere to a low carb lifestyle. 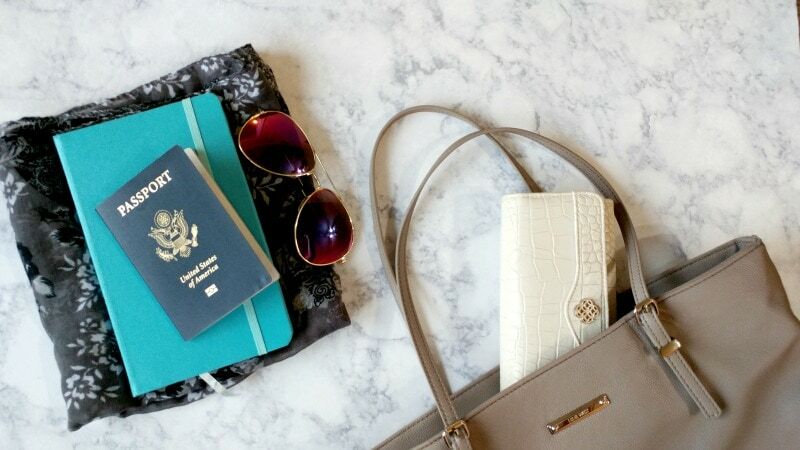 It’s not always easy to stay healthy while traveling, so I have a few tips for summer travel that I wanted to share with you today. Take a quick peek now before hitting the road this summer to keep your life balanced and your blood sugar stable. I find that hotter the weather, the faster my blood sugar seems to drop. I need to always carry a low carb, high protein snack with me in case I start to feel low. When we travel our routines are disrupted and we may be on a flight or on some kind of adventure that prevents us from eating our regular meals at our regular times. Keep your blood sugar stable by eating every few hours a small snack high in protein and low in sugar. By having a few protein bars, nuts or low sugar jerky on hand you will be empowered to make better choices (instead of impulsively grabbing a gas station candy bar when you get hangry) and you won’t risk dropping too low or rebounding sky high due to lack of planning. Staying hydrated is of course always important, but moreso while traveling. Again we tend to be more active while traveling, plus air conditioning and airplane cabins can be very dehydrating. Make sure you’re skipping sugary drinks (which are also more prevalent and tempting while on vacation) and drinking plenty of water. Be mindful when you’re indulging in those fruity cocktails that are often loaded with sugar. Vacation is no excuse for slacking! While most of us wind up doing MORE walking/hiking/moving while we’re on vacation, sometimes it’s tempting to park yourself in a lounge chair and not move until it’s time to go home. Be sure to incorporate some fun movement. You don’t necessarily have to suffer through the gym on your vacation unless you want to, but even some gentle swimming, or enjoyable activities like golf, snorkeling or power shopping can still help keep you fit while traveling. 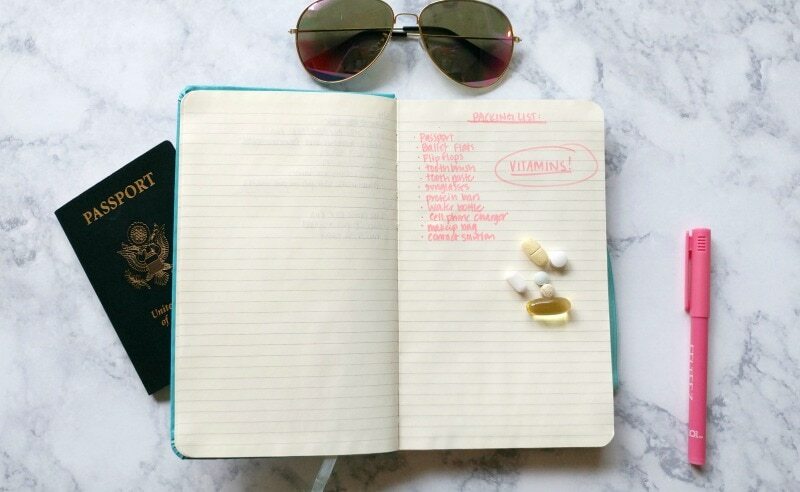 No one wants to lug around a bunch of pill bottles in their suitcase, so often vitamins and supplements are skipped when traveling. 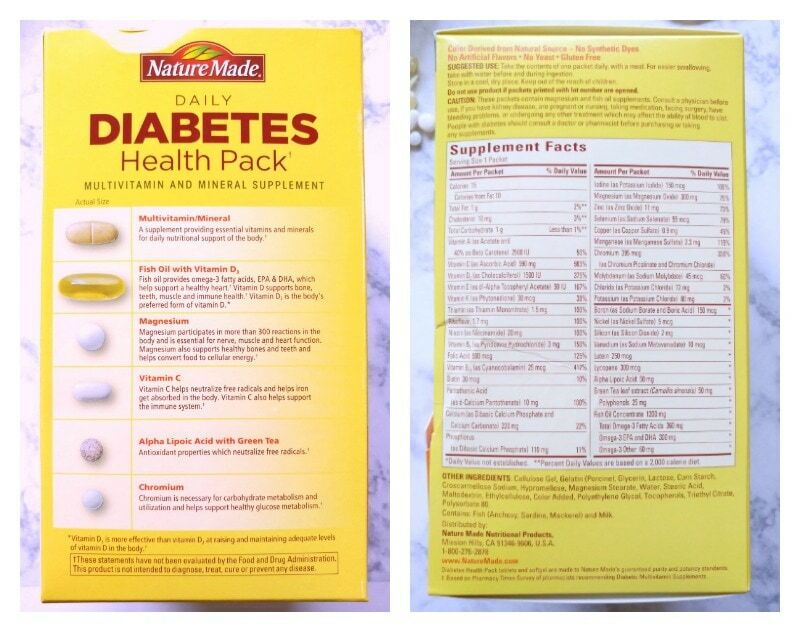 I like these Nature Made® Daily Diabetes Health Packs. 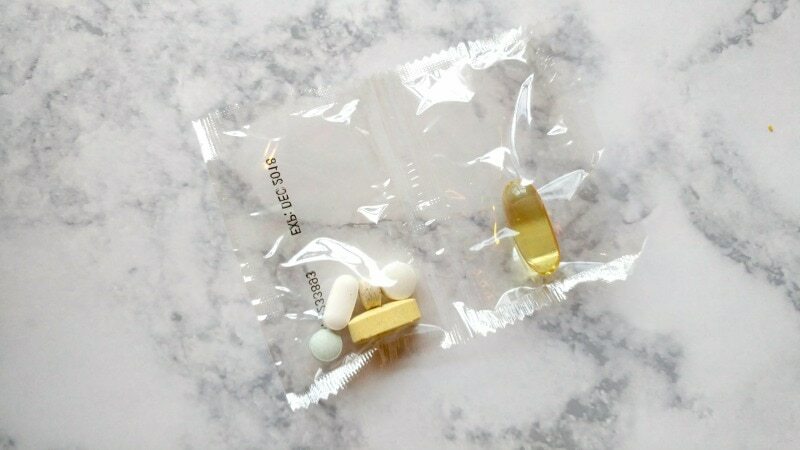 They are individually packaged supplements that make it SO easy to stay on top of healthy habits while traveling. No juggling giant pill bottles or worrying about counting them out into a bulky pill case. 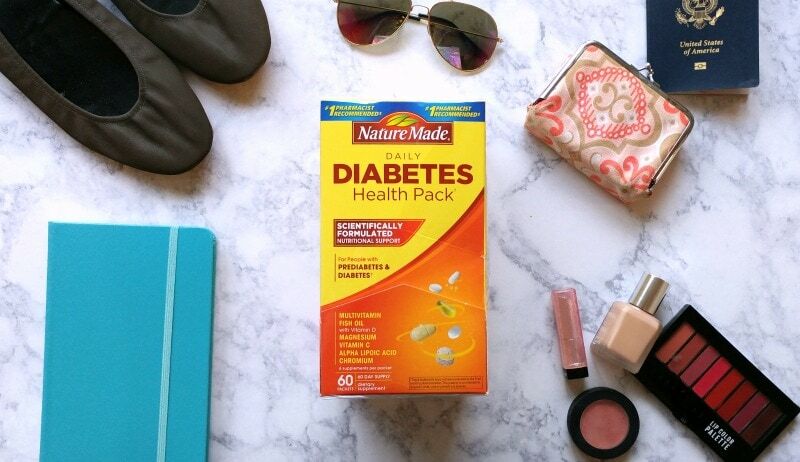 Nature Made® Daily Diabetes Health Packs help diabetics support a healthy lifestyle even when that means being on the go. DDHP provides nutrients you might be lacking from your diet†, especially when you’re away from home when we all tend to be lax in our self-care. I especially love the Nature Made® Daily Diabetes Health Packs because they contain all the supplements my doctor recommended to me for my dietary needs. You can buy a 60 count box at Sam’s Club which is a 2 month supply! The Nature Made® Daily Diabetes Health Packs are great for those who are Pre-Diabetic or Diabetic who want to support a healthy lifestyle†. I don’t let my health conditions ruin my summer travel plans. 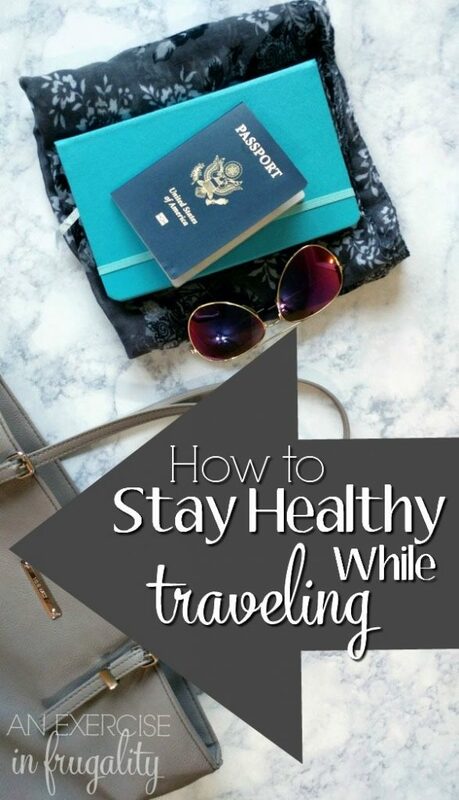 With the proper precautions and preparations it is easy to stay healthy while traveling while making healthy choices. Check out this free printable shopping list for more healthy living tips from Nature Made® and Sam’s Club! PS: If your Sam’s Club location doesn’t have these, you can order them online! So easy and delivered right to your door.